Rainbow’s End is a meditation on distances traveled and the larger human journey. It is inspired by the beauty of South Florida and the writing of John Steinbeck and Loren Eiseley. 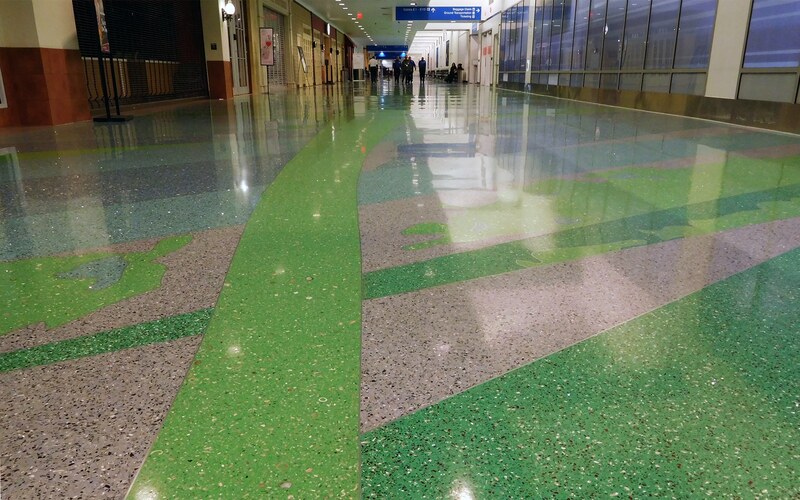 The total project includes approximately 80,000 square feet of terrazzo floor, including designs for Concourse E, Concourse F, and Terminal 3. To truly see around you, one must be humbled by the beauty in the smallest of things and yet be reminded of one’s place in the universe by contemplating the vast distances and scale of the cosmos. We have chosen to include both the stars and starfish which John Steinbeck wrote about from his journey. 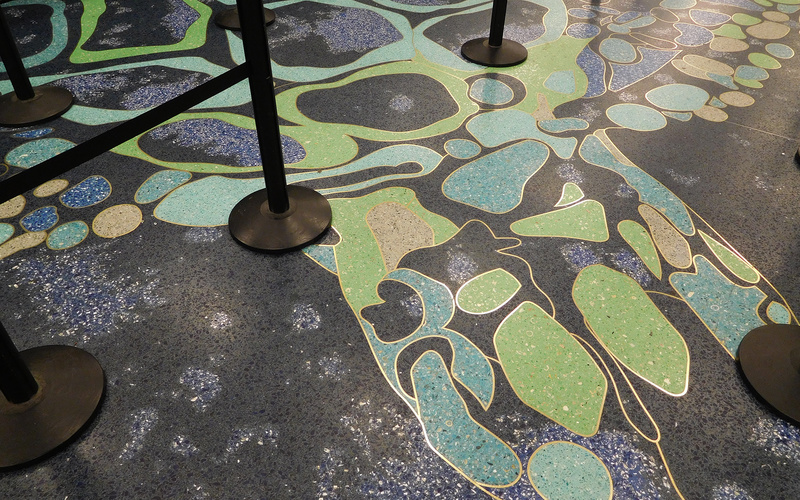 Swirling galaxies and starfish appear at the beginning of the concourse. As you walk further along, you will encounter the smallness of diatoms, sand dollars, and abstracted starfish along the way. 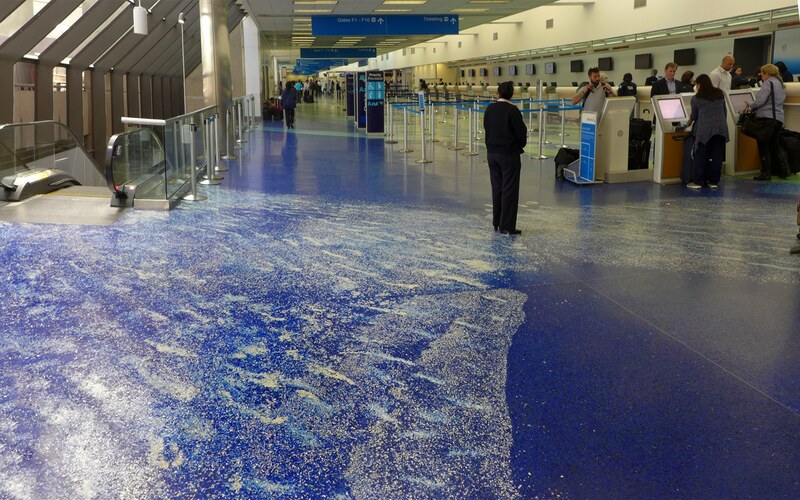 Numerous mirrored and mother-of-pearl shell pieces in the floor are meant to evoke the reflection of stars on the surface of the water. 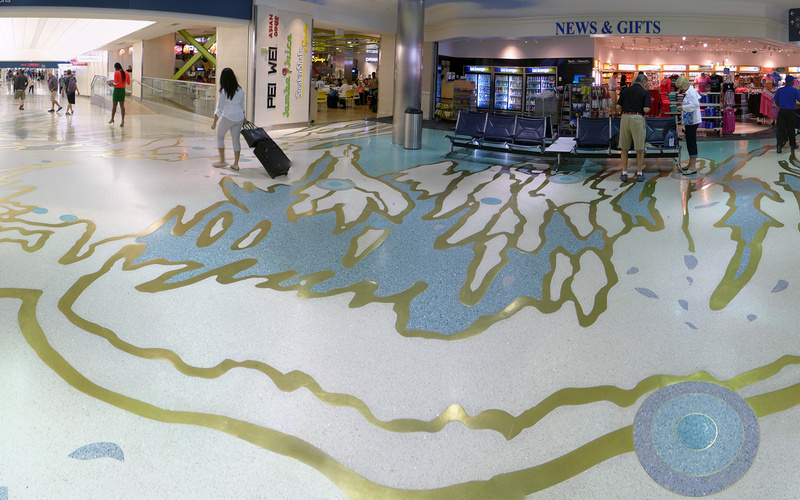 The end of the concourse concludes with an amazing array of starfish covering a beach. 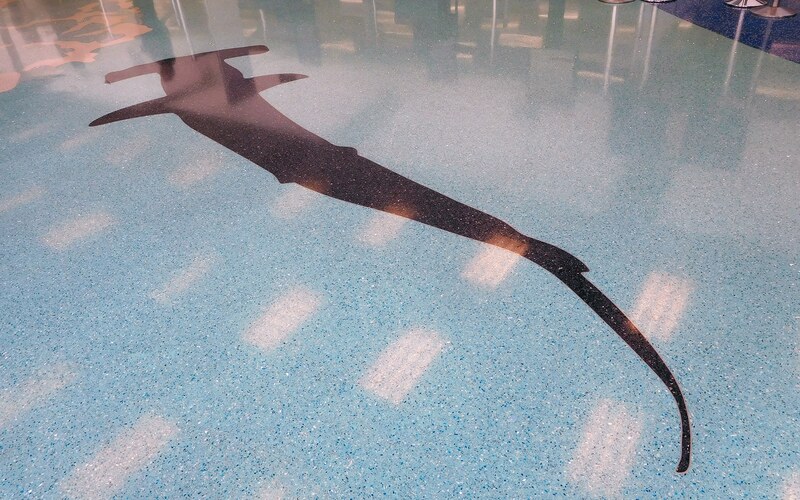 Our hope is that each visitor to the airport will connect his or her own travels to that of a larger sense of humanity’s immense and enchanted journey. 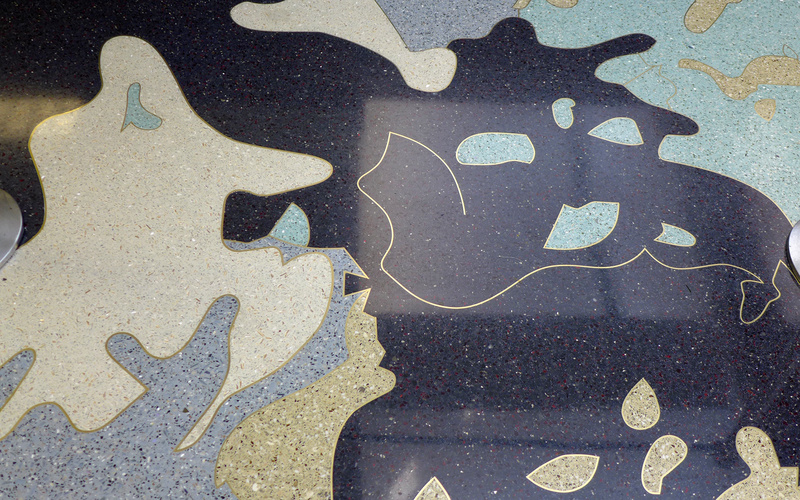 The design for the terrazzo floor in Concourse F begins with a poetic moment observing the sky’s reflection in water. As if in a dream, creatures float through the air while others appear to fly beneath the sea. 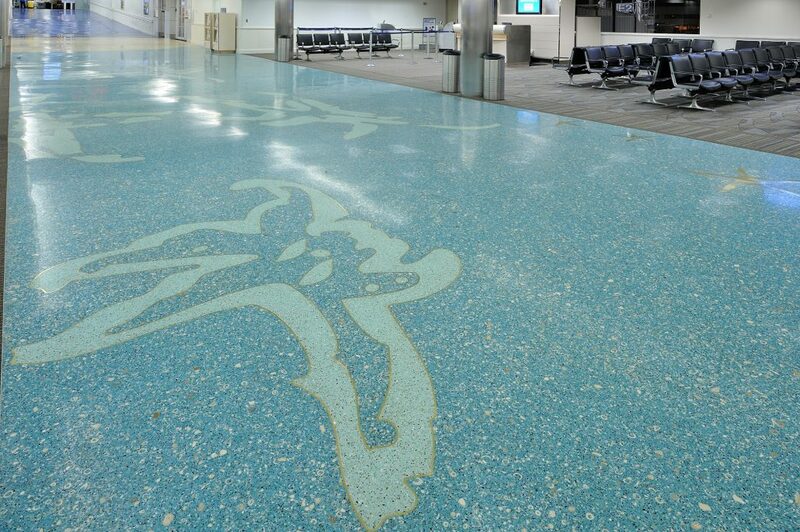 At the point where Terminal 3 runs into the concourse, the terrazzo floor design shows the flight of the constellation Cygnus, “the Swan”, one of the many species of waterfowl that are found in Florida’s Everglades. 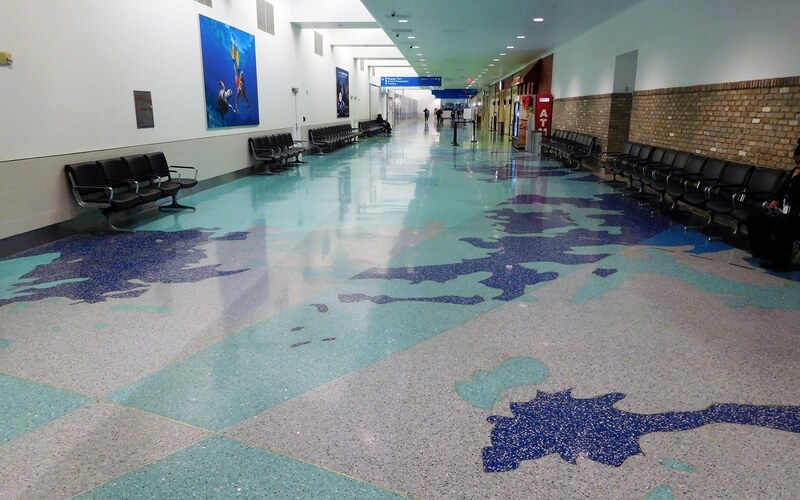 From there, the Concourse F design continues to the west with the celestial constellation Ursa Minor, “the Bear”, also known as the Little Dipper. The North Star “Polaris” is one of the stars that make up the Little Dipper. 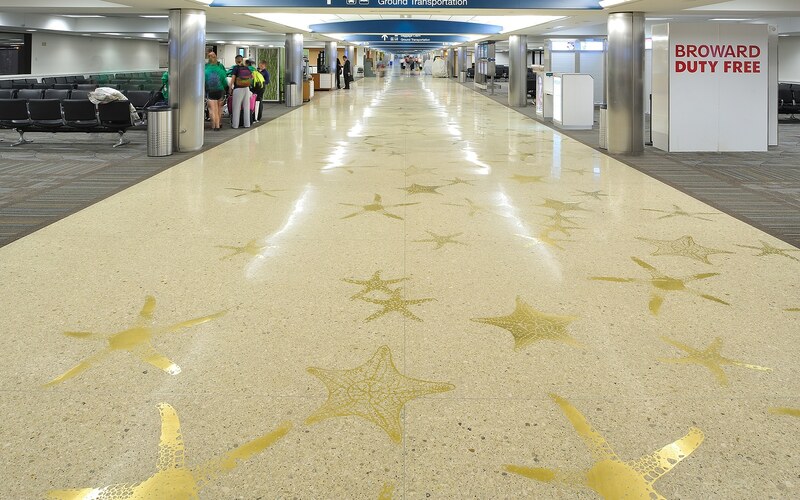 Continuing further along the concourse, the terrazzo floor design becomes sparer and further refined, showing other constellations of the Northern Hemisphere, random stars, and references to the Milky Way. 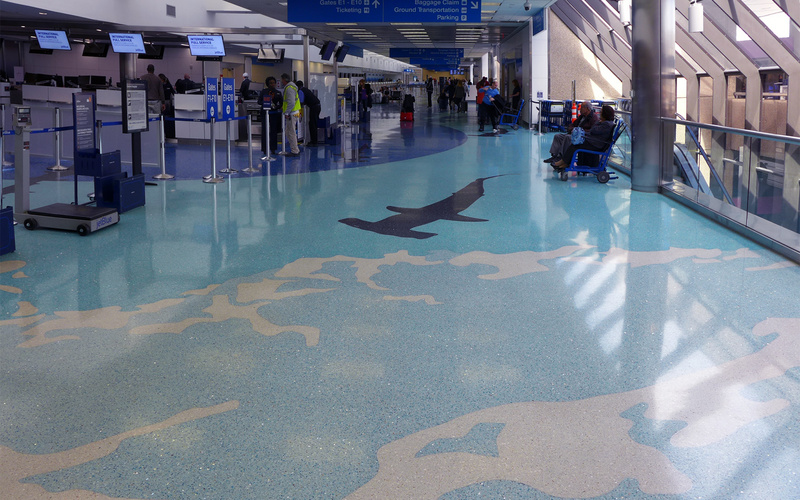 In this part of the concourse, manta rays fly through the sky, while imaginary 19th-century flying machines slowly pass by. 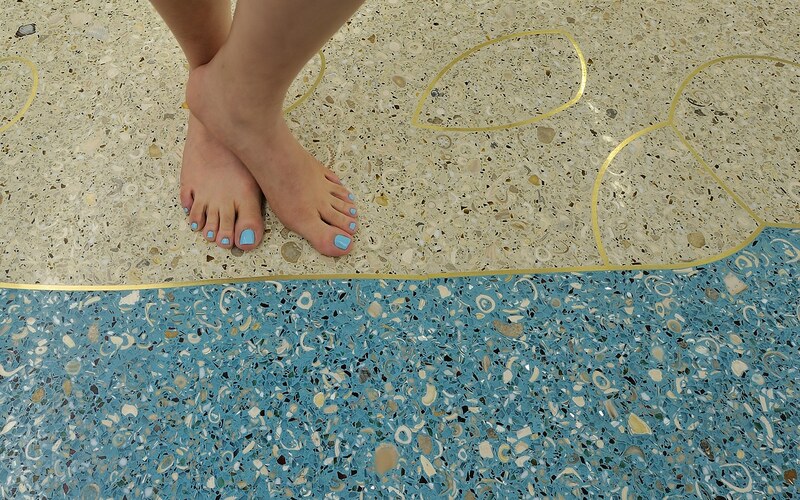 The Terminal Three terrazzo floor design reflects the vastness, beauty and complexity of the environments of Fort Lauderdale, Broward County, and South Florida. The uniqueness of this ecotone is defined by the flow of water, from freshwater to saltwater; by the Everglades biome to the west, and the Atlantic Ocean to the east. 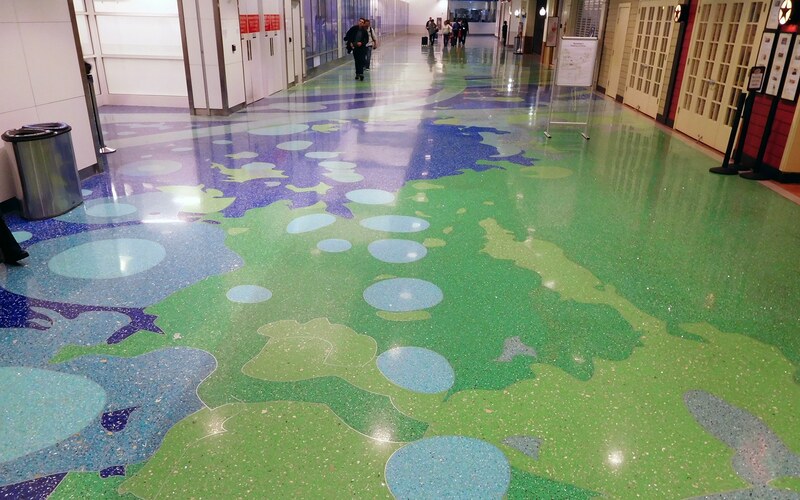 We have represented this environmental diversity with imagery of the ocean, tide pools, marshes, beaches, everglades, and sky. 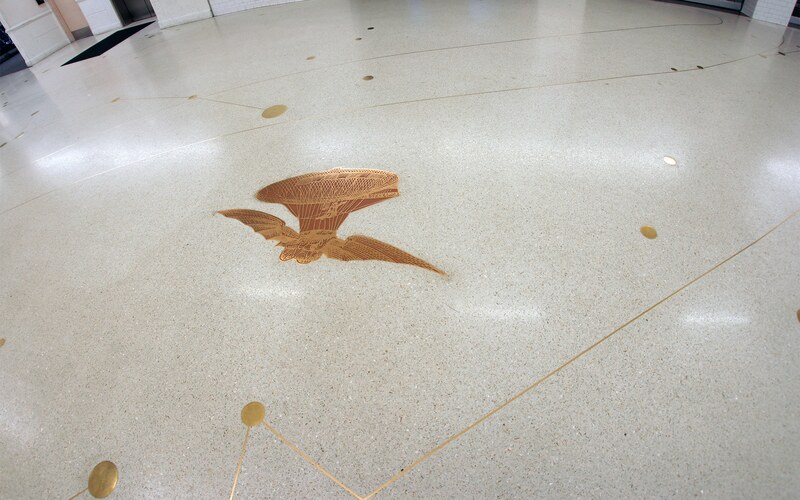 We have placed three cultural overlays onto this natural imagery, representing technology, history, and the human capacity for mystery. Aeronautics charts and subatomic particle paths define the scientific and topographical spheres for modern flight. Historic maps from the 16th- and 17th-centuries convey a sense of history and discovery, including the great sailing ships of the past. 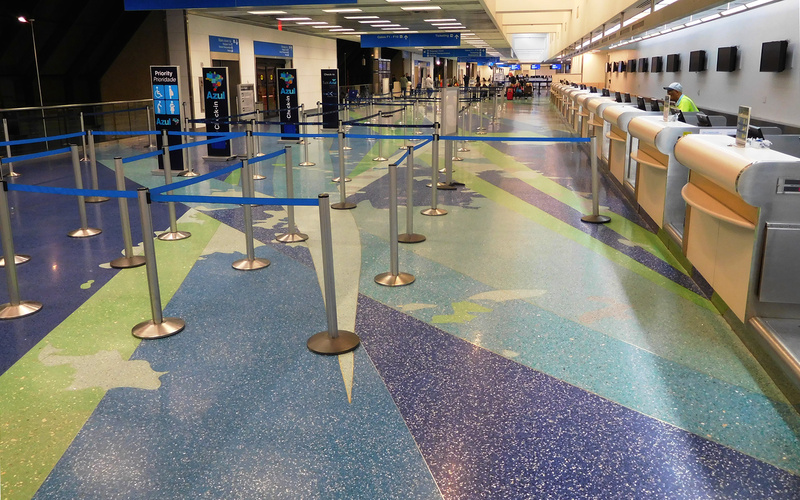 We want visitors who pass through this terminal to connect with this larger movement of history and discovery in their own adventures in South Florida and beyond. 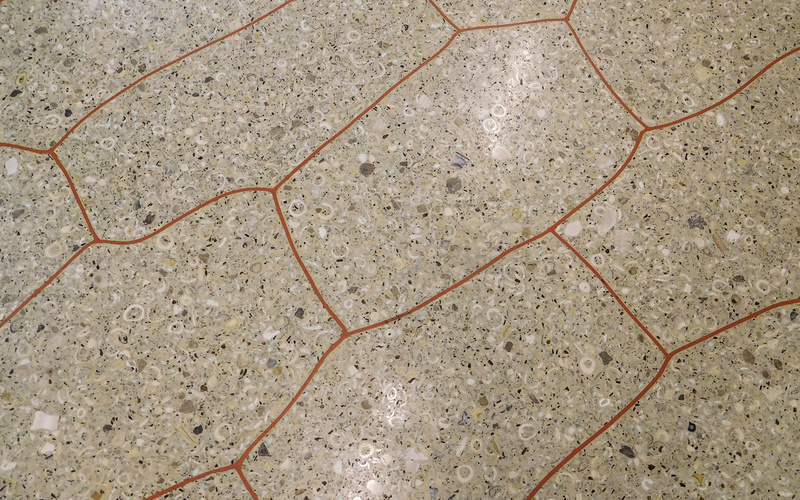 As airline passengers encounter the floor, a sense of mystery is enhanced through it’s scale and abstraction. In one area a school of hammerhead sharks pass silently through a cloud of dark blue waters, provoking a sense of beauty and the unknown. 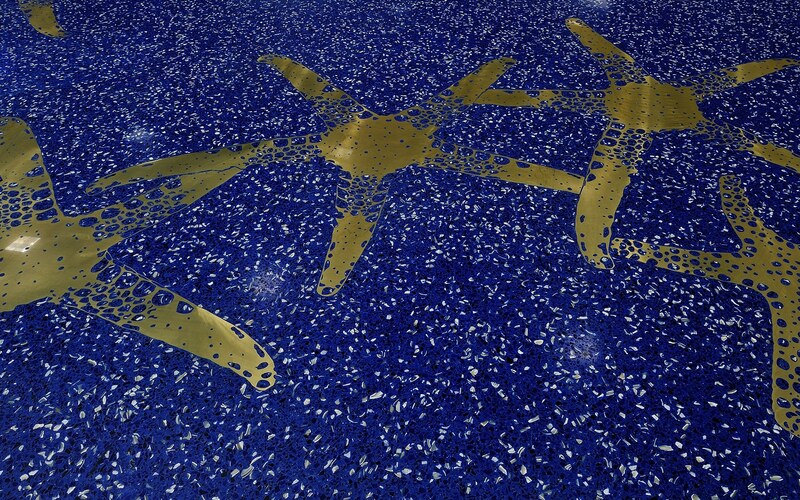 Starfish and stars appear together in reference to John Steinbeck’s writing from the Sea of Cortez. The story of humanity is one of a great journey: in a sense, we are all world travelers and explorers. We locate ourselves in the stories that evoke our comings and goings, affirmed by a painted sunset across the vast horizon of space and time. 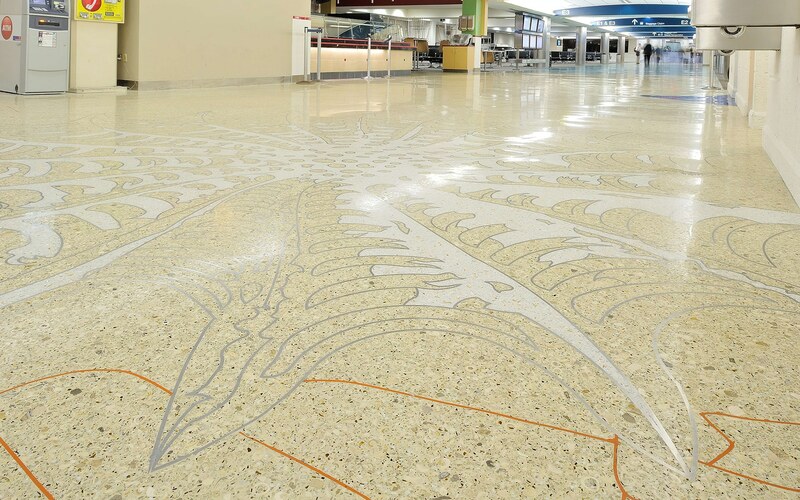 Created by the Artist Team: Scott Parsons and David Griggs. 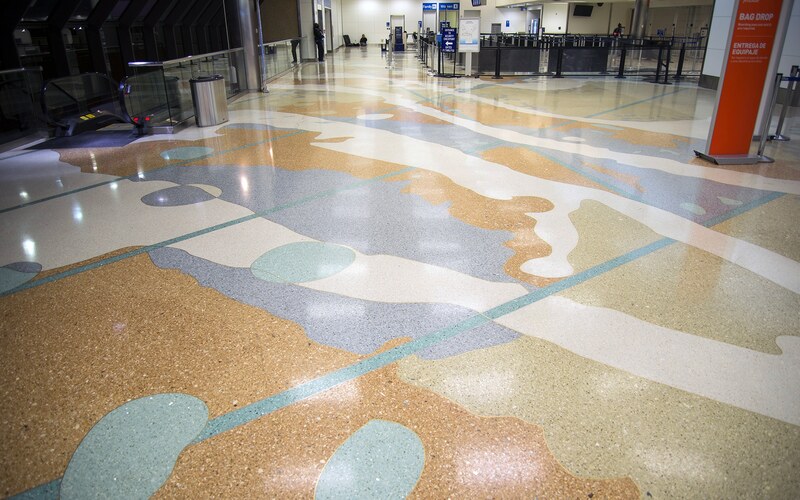 A 24-color 80,000 sq. 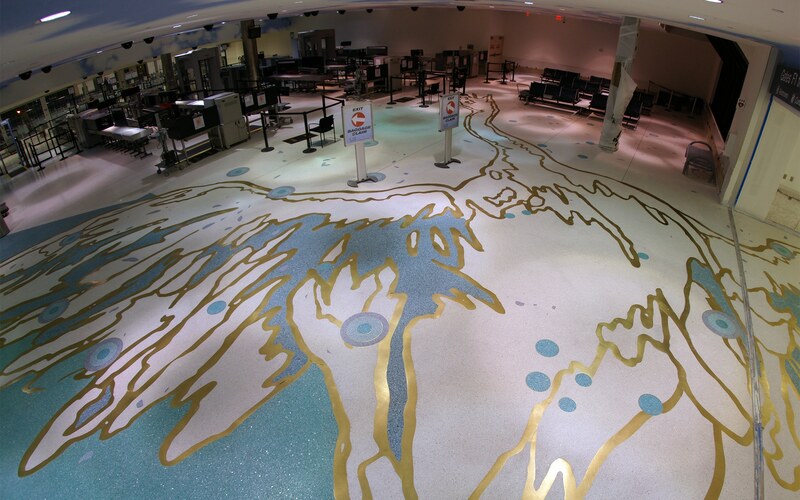 ft. epoxy terrazzo floor in Terminal 3 plus Concourses E and F at the Fort Lauderdale-Hollywood International Airport. 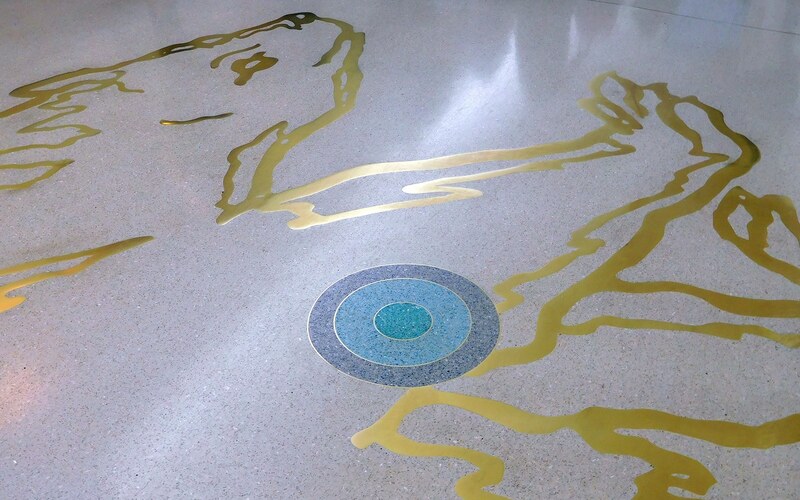 Assisted by Duane Hanson Allied Artist Steven Sylvester. Video by Damian Fitzsimmons and produced by Stuart A. Henderson, Brave Man Media.